She has become an iconic image over the years. Originally, the idea was to bring Miami Beach to Biscayne Boulevard. I had a great wall, and needed money to execute this so I sold prints of the piece before it was even made based on the concept alone. Since her inception, she has landed in national advertisements, and the major motion picture by Paramount Pictures, "Pain and Gain", starring Mark Walberg and Dwayne Johnson. The Michael Margulies Artist agency, The Benamor Group, Into Action Treatment, D.O.G, Printhouse U.S.A, and Oppenheim Architecture + Design. The series has since continued, and there is more to come. 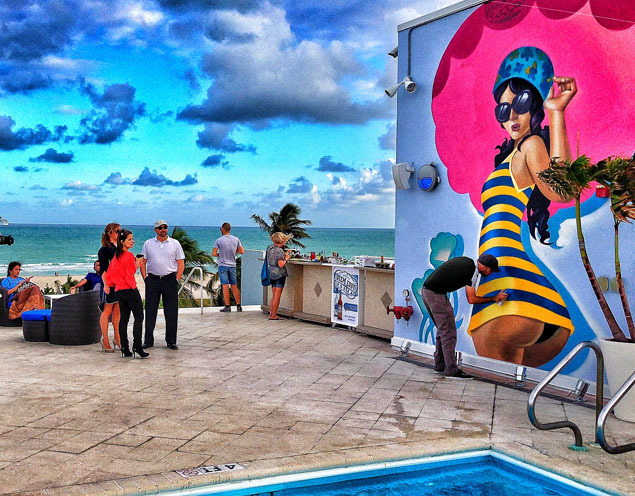 New Times - "The Ten Best Murals Outside Wynwood"